Steve Jobs only wears black mock turtlenecks and jeans. That’s it. He doesn’t want to think about what he has to wear so he wears the same thing everyday. It may be easy for him, but what about the rest of us? What if we want to see our favorite CEO think different when it comes to his wardrobe once in awhile? 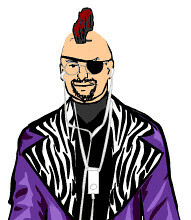 Check out this neat Flash game from geekculture.com called Steve Jobs Dress-up. Steve may not be able to handle a wardrobe change, but that can’t stop the rest of us from trying.